It’s two years since he swept to power, high-fiving with one hand, promises for “Real Change” in the other. So right now, on the post-honeymoon anniversary of his election to majority government, halfway through his mandate, it’s time to take a full, accurate measure of our 23rd Prime Minister, Justin Trudeau. The TrudeauMeter offers a starting point and an ongoing gauge. This non-partisan, collaborative citizen initiative is specifically designed to track performance on his platform. It lists 226 promises, spelled out in Liberal literature, speech-ified and selfie-fied during the federal campaign. Check off 59 promises made good, but also note well: work hasn’t yet begun on precisely the same number: 59. There are 72 works in progress. A useful word, going forward, is “porkies.” According to dictionaries, it’s cockney slang for shaded white “lies” as in, “Canadian Prime Minister Justin Trudeau has been telling ‘porkies’ again.” According to the TrudeauMeter, he has flat-out broken, and downright abandoned, a whopping 36 promises to millions of Canadians, who took him at his word and got him in (and Stephen Harper out) by, in many cases, voting strategically. The biggest fish he hooked, reeled in, used as bait or chucked overboard were electoral reformers, the environmentally inclined, the awakened millennials and First Nations. Justin Trudeau, in the Canadian cliché, “campaigns on the left, governs on the right.” The run-up to power takes place in a less-bloodied kettle of fish. Also swimming, circling Parliament, are schools of lobbyists, assorted sharks, bottom feeders and bureaucrats, entrenched in the old power game of government. Full marks for electoral showmanship, possibly gleaned from his part-time job teaching drama. Most unfortunately, Justin Trudeau, like far too many victorious politicians, in a post-campaign role, is now dancing with those ‘who brung him,’ the greedy elites who hold the real strings – the purse strings – and select and play the tunes. The rest of us, the vast majority, are mere sidelined wallflowers, Still, a number of grateful Canadians would likely give the Libs a passing grade, another whirl, just for erasing “Harper” from the national dance-card. Perhaps enough, two years hence, for a nod to stay on as a minority prom-king. Some will continue to hold their noses while pointing south to the stench of a madman and his company of conspirators, fleecing and disassembling all remaining reason, resources and democracy below the border. To be fair, in context, the worsening dystopia of Donald J. Trump was beyond even our former prime minister, who trumpeted, “Nice hair, but Justin’s not ready.” Few, if any, were fully prepared. Canada still looks good in comparison, while charting a best-course scenario through the unforeseen, current tsunamis of dangerously troubled waters, rippling and ripping northward. Endangered are trade, the economy, border security, immigration and foreign policy, etc., as well as life itself, through climate implosion or nuclear explosion. Surely “Real Change” is really just empty promise and stage-craft, unless it plays out in real-life. And we’re now nearing 2018. There are more than enough disappointing failures to reverse many Harper initiatives and broken promises for us to take issue with: pay equity legislation; marijuana legislation; a plodding, infuriating national inquiry into missing and murdered indigenous women; the $15 billion Canada received to provide armoured vehicles to Saudi Arabia, while there are still no funds for the 100+ indigenous communities that lack potable water; forecasted $10 billion deficits, now $23b, projected to soon tally $28.5-billion; the outed, tax-evading Finance Minister and his suspect two budgets; increasing lack of free access to information (Canada now ranked 46th, between Peru and Bulgaria); big buck infrastructure work, being doled out from the Commons to private predators – ad infinitum. In arguing for a mid-course correction, Elizabeth May has posted detailed, teacher-like, subject-to-subject second year Liberal letter grades on the Green Party website. 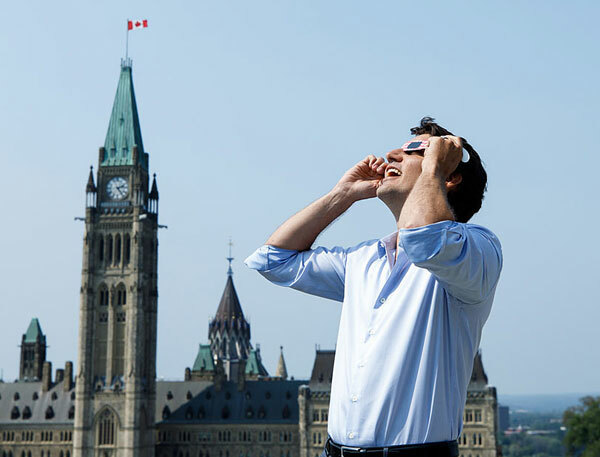 From a purely west-coast perspective, let’s give the federal Liberals a generous, encouraging C-minus; their leader, a hard and fast D-plus, with lots of room to roll up his sleeves for needed improvement. In two years, Canada’s cautious optimism has churned and morphed into brick-like cynicism. Justin Trudeau has squandered his, and our, potential. He’s out-of-touch and tone-deaf to the growing chorus of Canadians struggling for a living wage to pay rent, let alone save up for a down payment on a house, post-secondary training or decent childcare. “Canadians do not expect us to be perfect; they expect us to be honest, open and sincere in our efforts to serve the public interest,” Trudeau opined. Trudeau, the second, has two years until finals, to cut to the chase, pull up his designer socks and cut down on selfies and play-acting. And above all, cut out the porkies. Bruce Mason is a Vancouver and Gabriola Island-based banjo player, gardener, writer and author of Our Clinic.